10 Tips for a New Year’s to Remember. So you’re hosting a New Year's Eve party. No biggie. Just the pressure to make it THE GREATEST NEW YEAR'S EVE PARTY IN THE HISTORY OF PARTIES!!!!! And while your mind may be filled with fountains of endlessly flowing champagne, the world's greatest fireworks display and pure extravagance, chances are you're just like the rest of us mere mortals with a budget to stick to and reality to keep in check. So here to help are a few of our favorite party tips that will make sure your New Year's party goes off with a bang. No, not the volume, but the number of invites you give. Sometimes the best parties are made with a smaller group of friends rather than every one of your Facebook friends. We've hosted parties with over 100 guests and done several with just 10 or less and no matter what, quality always wins over quantity. If you go big make sure you think of inviting friend-clusters, that way pockets of friends remain self-sufficient and you limit the number of people feeling left out. Of course, a small and intimate group of friends can make for a more inclusive collective and it means you spend more of your night with the people you care about and less fussing about being hostess. Music will be key. Depending on what type of soiree you are hosting will depend on the kind of music you want. The more intimate the party the more recessive the music should be. Think of it as being mood music that supports conversation. Of course, if you want people up and dancing with a positive vibe going all night then having a great playlist will get everyone moving. Lighting sets the mood for your event. The aim should be to create a warm, welcoming environment that lets your friends relax and feel at ease. Too bright and it will feel cold and sterile. Hit the dimmers or turn off those overly bright ceiling lights and try to use more ambient lighting. We're also huge fans of indoor fairy lights which are great to create that party atmosphere and give a little magic to the night. What's a party without food, right? The secret is in easy to nibble on party food. The last thing you want to do is spend the whole night in the kitchen so grab some easy to cook and easy to serve nibblies from the store, pop them in the oven or straight into serving dishes. People tend to go through the following phases at a party when it comes to food & drink - drink, nibble, drink, food, drink, nibble, drink, drink. So make sure there is a steady supply of snacks to eat through the night and then a serve of a more substantial mini-meal within the first few hours. Make sure you have enough drinks AND enough ice. Balance the amount of alcohol you serve with non-alcoholic and soft drink options. New Year's is an excuse to let your hair down after a big year so be sure that while people are drinking up there's also food available. We also HIGHLY RECOMMEND encouraging your friends to UBER or LIFT their way to and FROM your little shin-dig. 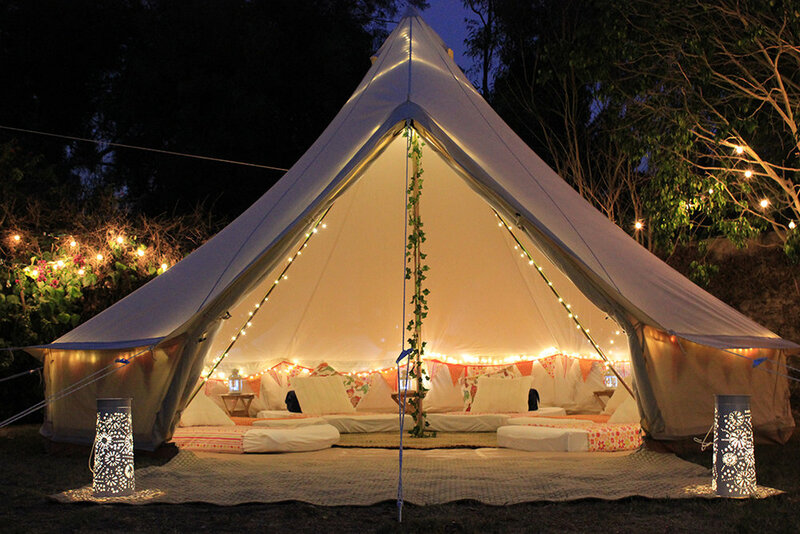 Also be prepared for that one or two guests who might need to spend the night - might we recommend a WonderTent setup! If you think someone has had a little too much, make sure they either spend the night or get home without getting behind the wheel. Good times often equals a big clean up at the end of the night. So get a head start by using paper plates and plastic glasses and cups for big groups and have designated bins around the party. Another handy hint is to do a quick clean once or twice as you go as it cuts down the workload at the end of the night but more importantly will enrol one or two guests to help out as well. The whole aim of New Year's is to have fun so spend a little on some props for the night. Hit the local discount store for supplies like party hats, streamers and poppers, and photo props. Don't spend too much, after all its just for one night, but a few little fun options will get people in the mood sooner. Figure out in advance how you're going to countdown to midnight and be sure to have a clock in clear view so everyone won't be asking you, "What time is it?". A great option is to have the TV on and watch the Times Square ball drop. If you don't want to be the official timekeeper, designate someone in advance to lead the countdown. And if you have little ones check out Netflix who, for the fifth year running, has just published a slew of videos that offer a "fake" countdown clock to midnight. The genius idea here is that the videos can be played at any time. So your kids can join in on the New Year's Eve festivities and still get to bed on time. This year’s videos include characters from Alexa and Katie, Prince of Peoria, Pinky Malinky, Motown Magic, Skylander Academy, Super Monsters, Boss Baby, and Fuller House. Just search for "New Year’s Eve Countdown” or “Countdown” to locate these videos or get quick access via the "Kids" row on the Netflix menu. 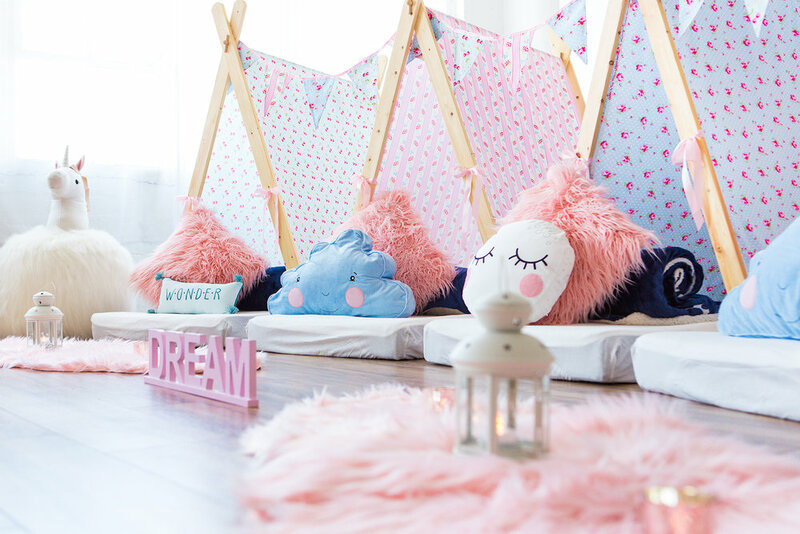 Speaking of kids, if you're looking for a way to keep them entertained why not treat them to a wonderful SleepOver or GlampOut experience. 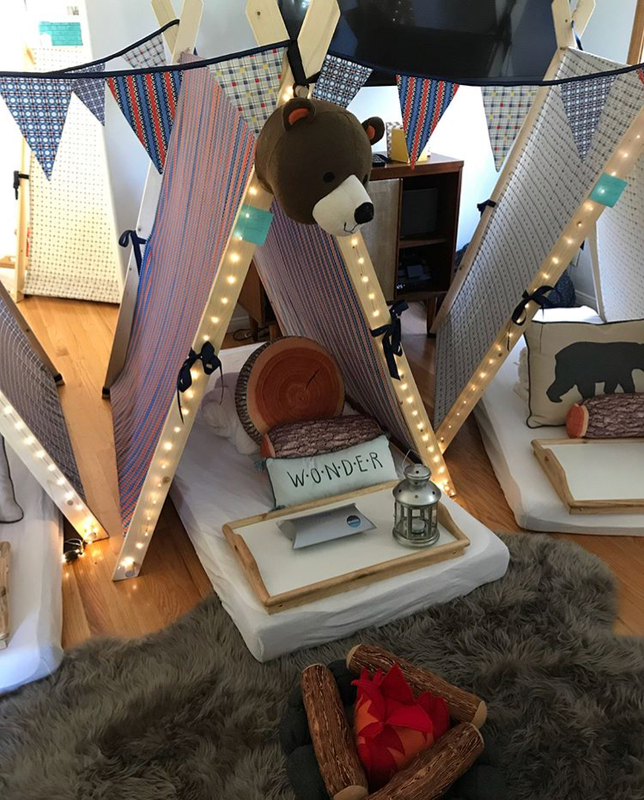 We can help set up a SleepOver in your living room to get them set for the night and keep them entertained with a movie or two. 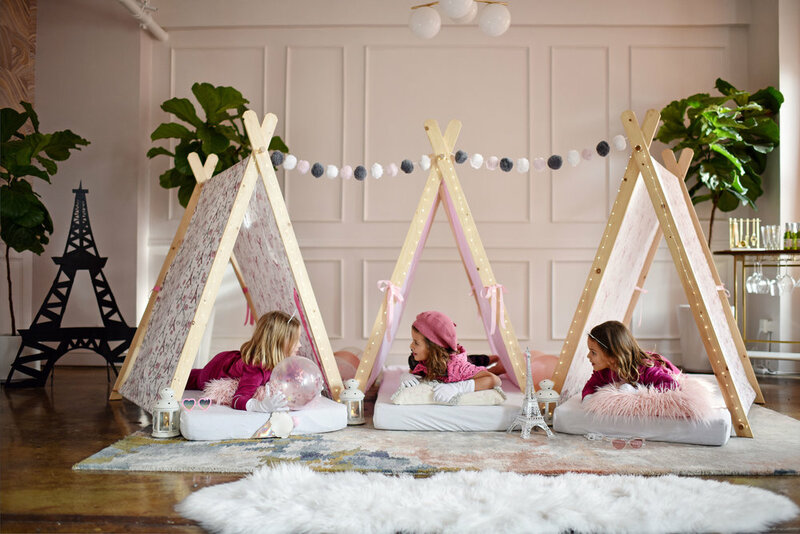 Or celebrate in the ultimate of style with our GlampOut option and have the kids camp out under the WonderDome while the "boring old adults" get to party with their friends. And yes you can book a SleepOver or GlampOut for you and your friends too for that truly memorable New Year's experience. They're also a great solution if you're expecting you might need to have space for a few friends to spend the night. As the host it's best to lead by example. Have fun and your guests will too. Don't take on too much to do during the party. Where you can pre-plan activities and make food a breeze to prep and serve. Give yourself ample time to just enjoy the night being surrounded by friends and family. So, however you celebrate we hope you enjoy a memorable night. From all of us here at WonderTent Parties we wish you a very Happy New Year and hope 2019 brings you everything you could wish for, and then some.